I’ve always loved elephants for as long as I can remember. The older I get, the more amazed I am by them. They are incredible and endearing. They are wrinkly and gorgeous. They are smart and feel many of the same emotions as humans. And they are disappearing at an alarming rate. It’s pretty common knowledge that this tragedy is due largely to the ivory trade. Presently, eight out of ten elephants are killed for their ivory, rather than dying naturally. Despite recent efforts to ban the trade of ivory, elephants could be extinct in 10-15 years with the current rate of poaching. What most people don’t think about, however, is the baby elephants that are left for dead when their families are killed for ivory, the poacher’s side of the story, and the entire ecosystem supported by the presence of these magnificent creatures. 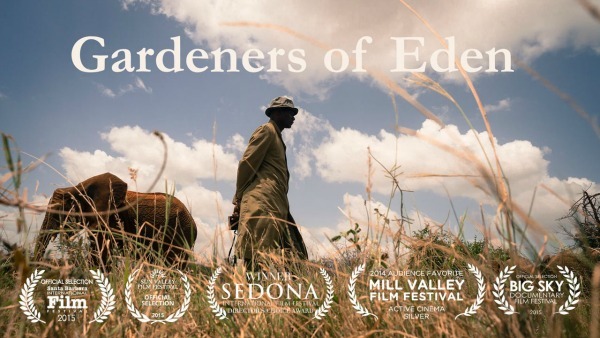 I sat down and watched the critically acclaimed documentary Gardeners of Eden to learn more about the struggle behind poaching & the ivory trade, and the incredible organization in Africa fighting to save an entire species. The following are facts that everyone should know. David Sheldrick was a famous naturalist and the founding Warden of Tsavo East National Park in Kenya. In honor of his memory, his wife Daphne founded the David Sheldrick Wildlife Trust in 1977. The main mission of this organization is to conserve, preserve and protect wildlife. This includes anti-poaching efforts, educating the local communities, providing veterinary care to animals in need, and safe guarding the environment. They also run the hugely successful Orphan’s Project in Nairobi, rescuing and raising infant elephants that have been orphaned in the wild. Yes, baby elephants are just about the cutest thing you will ever see. But watching them being transported to the safe haven of the wildlife trust because their families have been killed and now they are scared and alone is heart-wrenching. There are so many issues that go along with rescuing and rehabilitating these orphans. First off, many of these elephants witness their families being killed by humans, so when they arrive at the sanctuary and are being handled by more humans, what are they to assume but humans are their enemies and will try to kill them as well. It’s very confusing for them. Like human children, the orphans experience physical and psychological trauma after losing their families. They grieve. To complicate matters further, baby elephants are very fragile. If they are injured, malnourished or neglected, they can die very easily. Just because they’ve been rescued doesn’t mean everything is okay and they will survive. Many of the infants die despite intense medical care. The caretakers at the elephant nursery spend years with these infants, sleeping with them at night, feeding them, playing with them, loving them and being their adoptive family. 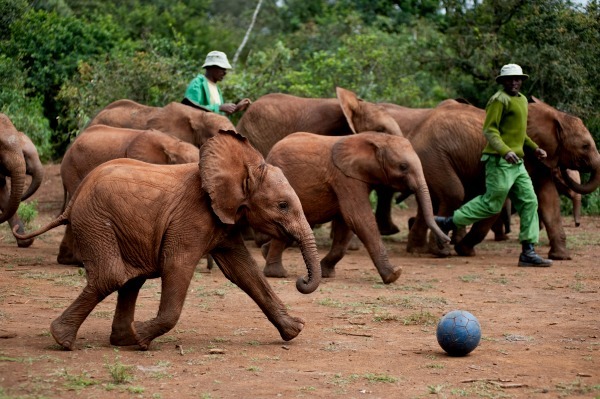 Collectively, they’ve raised over 170 orphaned elephants. It’s bittersweet to watch the elephants run around their caretakers like little puppies and wrap their trunks lovingly around them. It’s a strong bond, but one they should be having with their families that have been killed for ivory. Africa went from 10 million elephants in 1900 to 300,000 in 2014. That’s pretty astonishing. And despite a slew of anti-poaching tactics backed by the trust, Tsavo National Park is still a hotbed for poachers. The poaching trade today is the equivalent to the drug trade. Even though the guns and poisoned arrows are meant for the elephants, poachers won’t hesitate to shoot at anyone that gets in their way. Ivory is worth more than gold, so why is it that the poachers themselves aren’t even making that much money yet continue to illegally enter the park and destroy these animals’ lives and the babies they leave behind? Most poachers come from local villages that are extremely poor. They are husbands and fathers who have families that are hungry and in need, so the only option they have left is to hunt illegally in the park to make money. The higher ups in the ivory trade are the ones that are really profiting, not the poor villagers. It’s a delicate balance because many of the locals believe that since their ancestors lived there, the land is theirs and they can take what they want. There are others who sympathize with the elephants but continue to poach out of desperation. As Dame Daphne Sheldrick describes in the documentary, there is no co-existence between animals and humans. That’s a big problem. And not just when it comes to poaching. Daphne makes the point that humans are actually the endangered species because we’ve stepped out of nature. We’re jeopardizing our own survival. I wholeheartedly agree. Obviously, ivory needs to be banned internationally. No tricks. No loopholes. 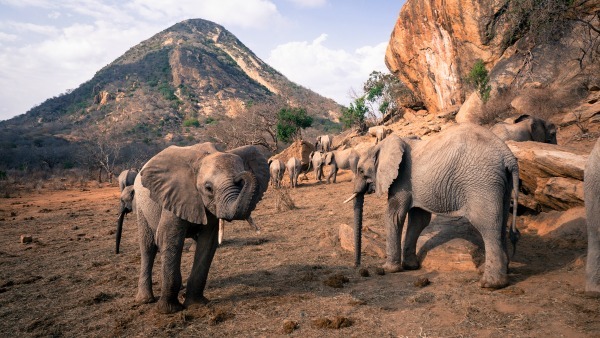 In 2008, China and Japan were permitted a one-time purchase of African ivory stockpiles in an attempt to flood the Asian market with so-called “legal ivory.” Instead of reducing demand, prices soared and ivory trafficking tripled. None of that baloney. We also have to stop and realize that demand fuels the market. If there weren’t people worldwide buying ivory trinkets to place around their homes, innocent creatures wouldn’t be slaughtered for their tusks. That convinces me even more that the poachers aren’t the problem at all. It’s not likely that people all over the world will sympathize enough to stop buying ivory, so we need to go straight to the source. What if stable jobs were provided for the local villagers that would otherwise turn to poaching to make ends meet? If the African government or other organizations/companies came in and gave villagers better options that paid decently, my guess is they would take it. And if there’s no one willing to kill the elephants, then there’s no ivory to trade. It’s probably not that simple, but it’s a thought. The David Sheldrick Wildlife Trust doesn’t claim to be the solution to the problem either. They think of themselves as more of a holding point where some elephants are given a second chance. The trust hopes that once the world becomes a better place for elephants, there will actually be some elephants left because of their efforts. Check out their website to get more information about what they do and how you can help. Watch Gardeners of Eden. It’s an amazing film with beautiful images of elephants. It’s graphic at times, but I think it’s important for people to see the devastation that is taking place. Gardeners of Eden is uplifting, funny, heartbreaking, hopeful and will make you want to change the world for elephants. Considering that an elephant in Africa is killed every fifteen minutes for ivory, we need more change-makers. I enjoyed your post on the “ephelants”. I didn’t realize their numbers had diminished so drastically. I always find at least something to chuckle at in your adventure stories; a little quip or an admission. This time the line, “It’s probably not that simple, but it’s a thought” just struck me as really humorous. 🙂 It’s hard to believe that some humans can be so ruthless and careless. Your dedication and optimism is inspiring. Thank you for the article.